Promenade drill teams are a combination of learning and refining horsemanship skills and riding drill routines. The goal is to become precise before adding speed. Most of our drills are done at a trot. Students must be able to walk, trot, stop and turn their horses. Our drill teams are based on ability so any of the drill teams are made up of various ages. The second Sunday of June is our annual performance at Promenade where the members can invite family, friends or anyone interested in drill to come watch the performances. After demo day we hold a drill camp so new people can learn the basics of drill in order to join one of the teams. Monthly fees are paid the first day of the month that the group meets. New members are welcome to join at any time of the year. Please contact us for more information or with questions. As drill members progress in their riding and drill skills they can move up to performance drill. Performance drill team performs in events such as rodeos, local parades, and the Rocky Mountain Horse Expo. This team usually meets twice a week in the summer. Boys drill team at Promenade is designed for boys to ride together, and is made up of boys and men. The men have been great role models to the younger members, as it is not often you see men riding for the sake of improving their horsemanship skills. It is a fun team, but they strive to improve their horsemanship skills together and learn drill maneuvres. Members can join anytime of year. This drill team meets on Monday afternoons 3.30-5.00 in the summer and 4.00/4.15-5.30 during the school year. The students get their own horses ready during the summer months but are assisted by volunteers and staff during the school year. Student ages range from 7-15 years old. Drills are trotted but members practice trotting. This drill team is for those that need to ride on the weekend and want to be part of a drill team. This team trots their drill but is starting to canter. This team meets Wednesday afternoons from 12.30-2.00 p.m. It is a great way to combine physical education requirements and social skills by being on a team. This is our newest team at Promenade. 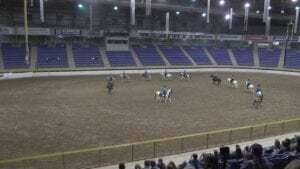 Adult drill team is a new drill team for adults who want to learn to ride drill. We have horses you can ride, or you can trailer in your own horse. 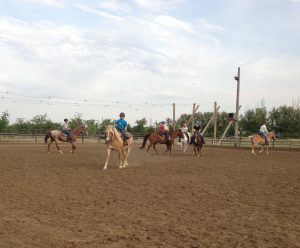 This is currently a small group of beginner or intermediate riders, learning about drill team riding, connection with horse and horsemanship. 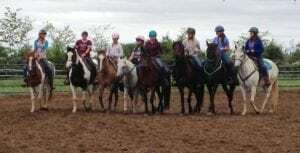 We learn drill riding, horsemanship skills and the aim is to have fun whilst enjoying time on a horse.